Minuum keyboard, a darling of the up-and-coming Indiegogo community, finally launched as a beta to backers earlier this week. We were lucky enough to be one of the first few to gain access to it and have since spent two days on and off with this unique typing experience. It’s still only available to backers, so the beta is closed. And since you can’t all access it, we thought we’d at least share some thoughts, show the keyboard in action, and then let you decide what to make of it all. For those new to Minuum, think of it as a Fleksy-styled keyboard that has been squashed down into a single row on your phone. You get the same blind-typing-rapid experience and can use gestures to add punctuation or delete, but with only a single-row taken up, the majority of your beautiful display can still be enjoyed. 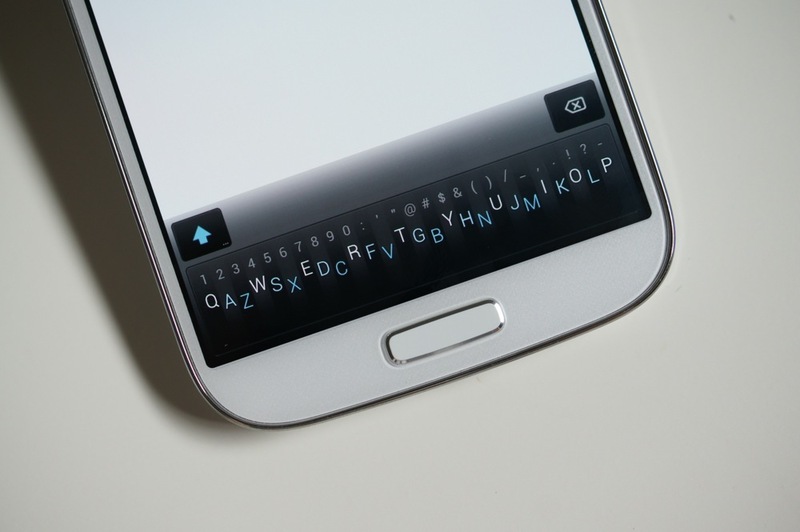 The Minuum team has simply taken the QWERTY keyboard, and squashed it. So in theory, you can type as you always have yet it all happens on one row of a keyboard. Accessing the number pad can be done through swipes up on individual keys, or with a swipe down you’ll swap out the QWERTY for an entire row of numbers. Punctuation is done in much of the same way. There are options to adjust the height, remove gestures, or even add on the traditional space bar and delete keys. There is actually a lot going on in a small amount of space. After spending some time with Minuum on Tuesday, then Wednesday, and now Thursday, I have to admit that I’m not really the biggest fan so far. The predictably of the keyboard seems top notch and is in my opinion better than most keyboads, however, typing out a simple paragraph takes far too long, especially if you need to spell anything out character-by-character. Or if you type slang or words that aren’t yet in the dictionary of Minuum – good luck. I’ve also found that while typing on Minuum, that I spent far too much thinking about the next letter I’m going to type rather than having it all happen naturally. That could be because this is an entirely new way to type and the style of typing needs to be re-learned a bit, but I’m not sure that’s such a good idea here. With keyboards like Fleksy or Swiftkey, you get the traditional keyboard experience yet they were able to add on ideas that make the experience more productive. I don’t see that being the case with a keyboard that was smashed down to a single row. At least for now. Would love to hear your early thoughts.